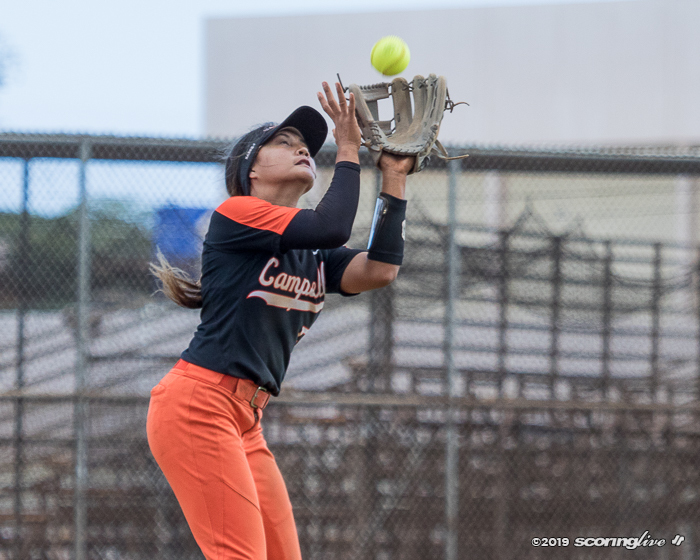 EWA BEACH — Top-ranked Campbell continues to live the charmed life in Oahu Interscholastic Association Division I West softball. 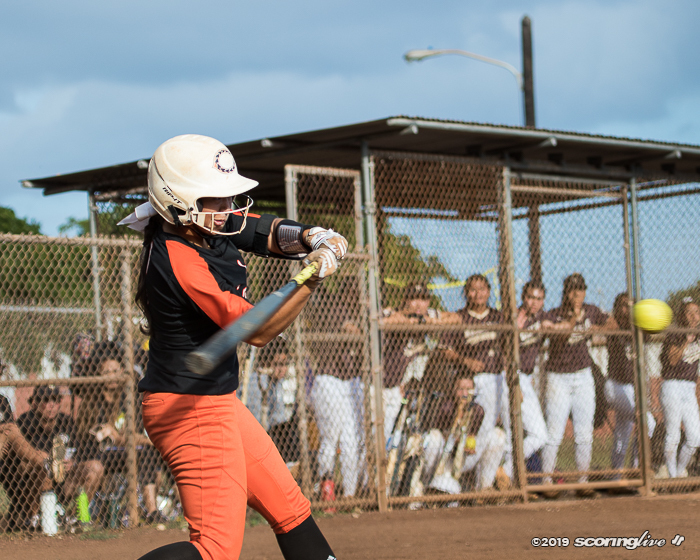 The host Sabers rallied for two runs in the bottom of the seventh to turn back No. 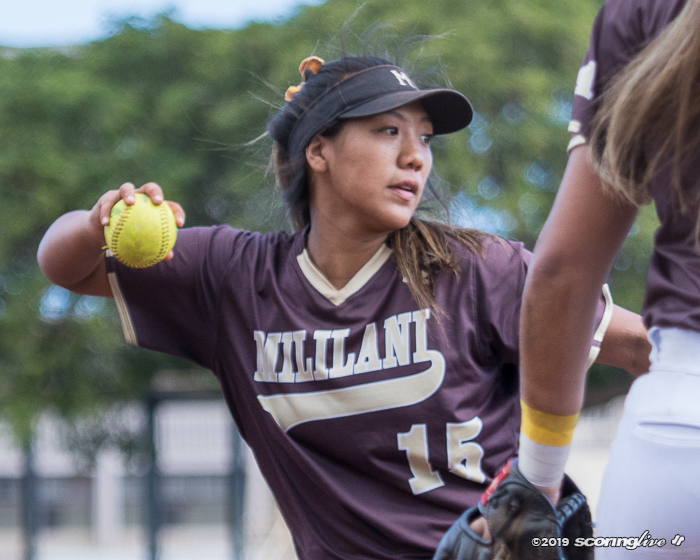 4 Mililani, 6-5, in a thriller Tuesday to stay atop the West at 6-0 after one round of play. 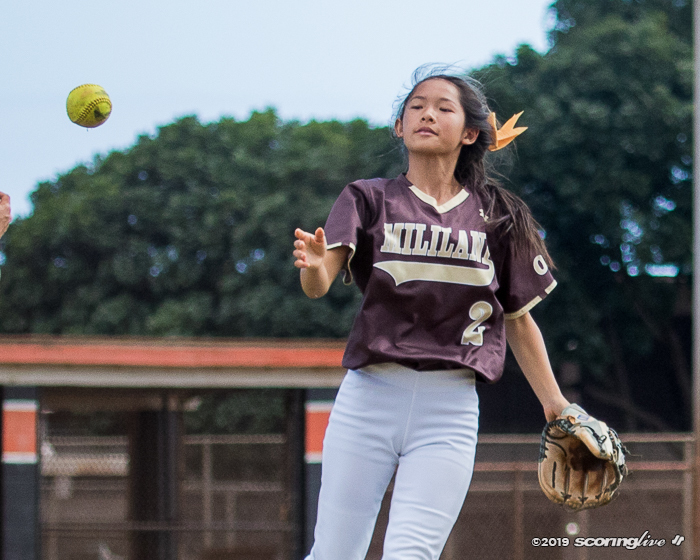 The Trojans (3-3) are tied for third with Leilehua (3-3). 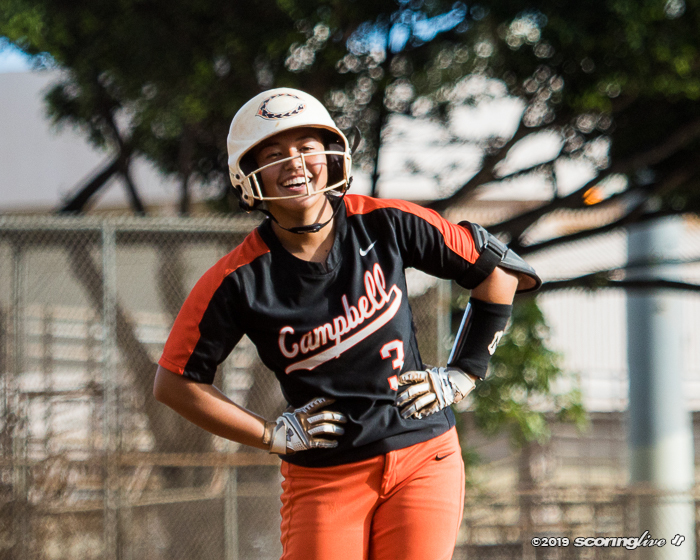 It was Campbell's fourth consecutive come-from-behind win this season. 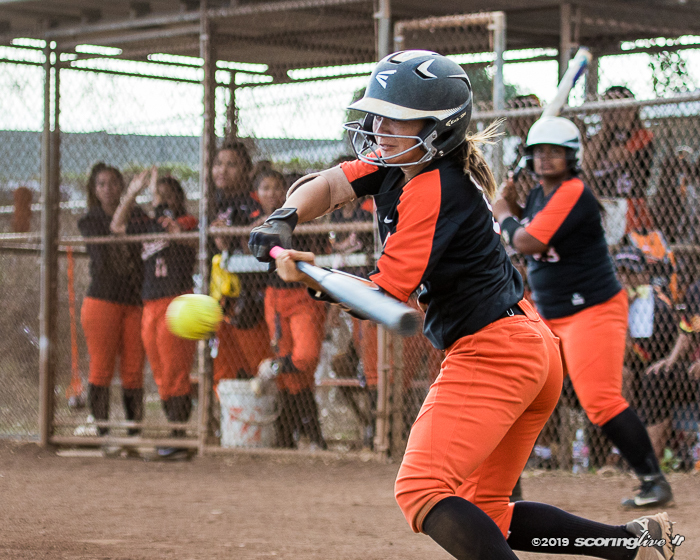 Three of those victories were won by one more run than the opponent. 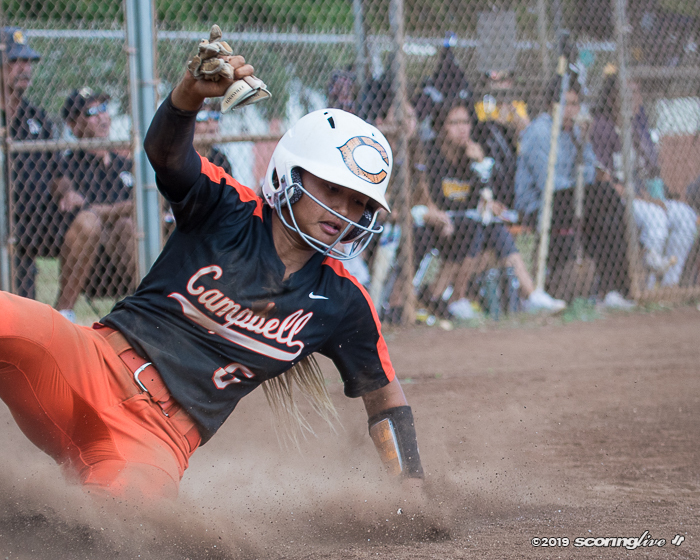 "It just tells me that these girls got heart," Campbell coach Shag Hermosura said of his team's gumption. 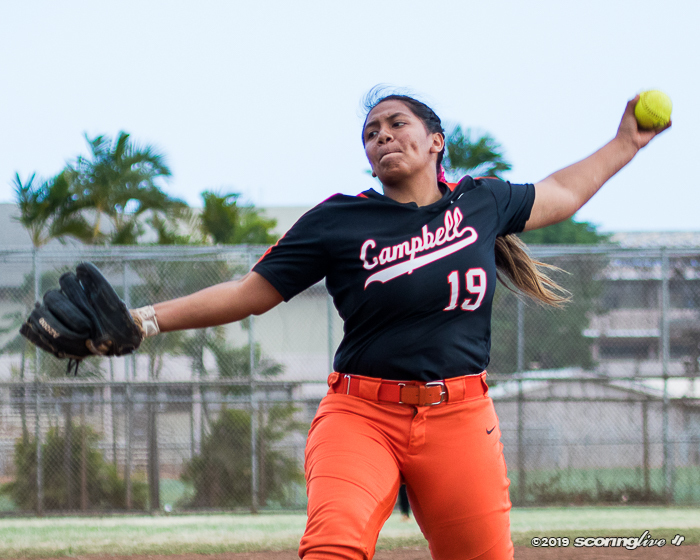 The Trojans nursed a 5-4 lead entering the home seventh with relief pitcher Nicole Arios in the circle. 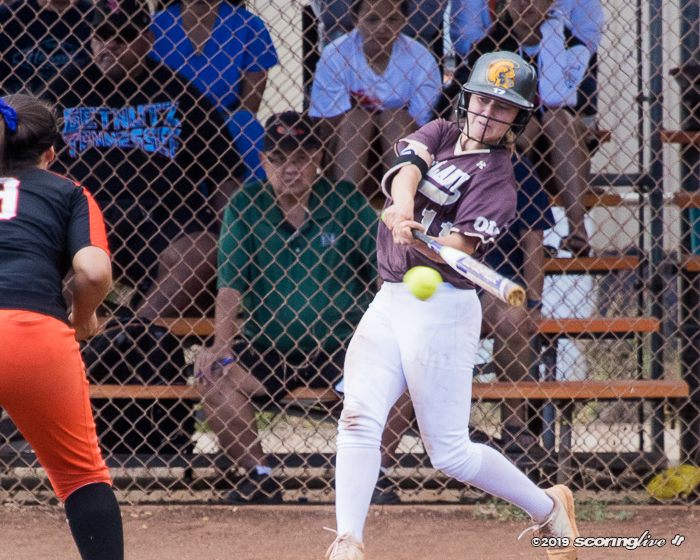 With one out, Dyllan Sanay-Shiraishi reached second on a double error by third baseman Jordan Okumura (the bobble allowed the batter to reach first with the ensuring errant throw allowing the batter to take second). Caisha Nunes walked to bring up Jayda Favela. 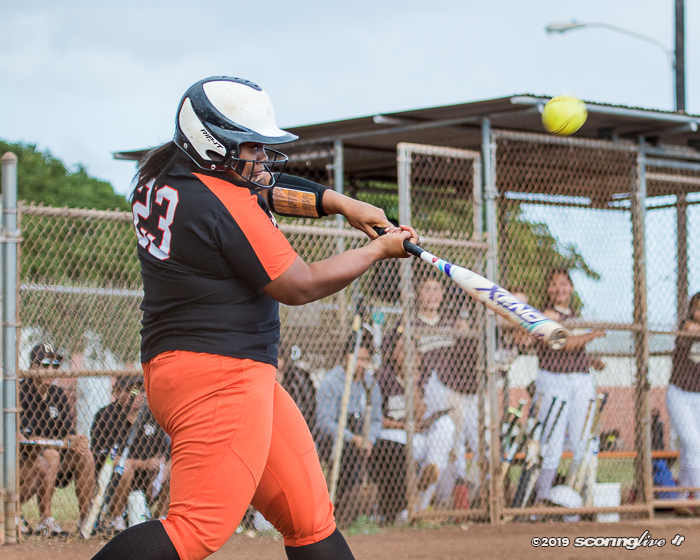 But a passed ball by catcher Tierra Dumlao on the first pitch moved the tying and winning runners in scoring position with one out. 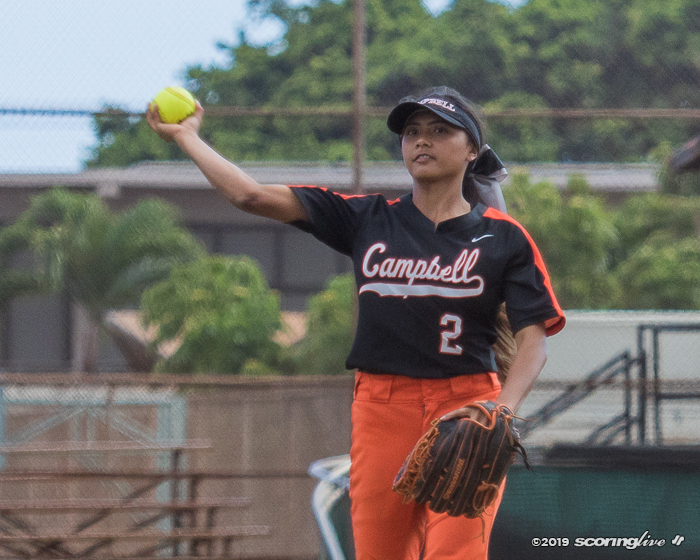 Favela worked a full count before slapping a hard grounder off of Okumura's glove that deflected to shortstop Rylee Nishimoto, who fired home late as Sanay scored the tying run as Nunes took third on the fielder's choice. 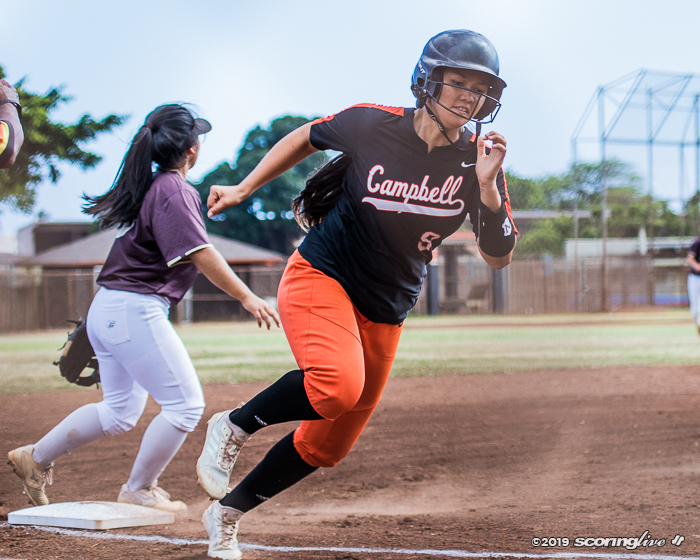 After coaching visit to the circle, the first pitch to Sanoe Samante sailed high and past the catcher to allow Nunes to score the game-ending run. 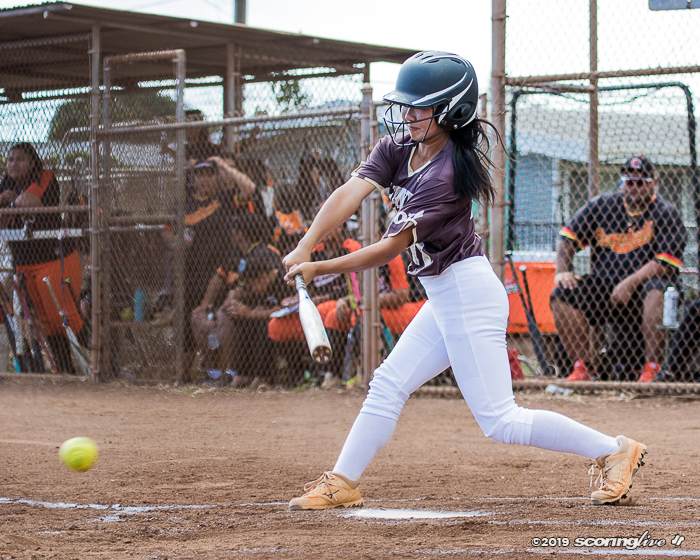 The left-handed hitting Favela, who had lined a single to left and beat out a single to shortstop earlier, was trying to work left side in her at-bat. 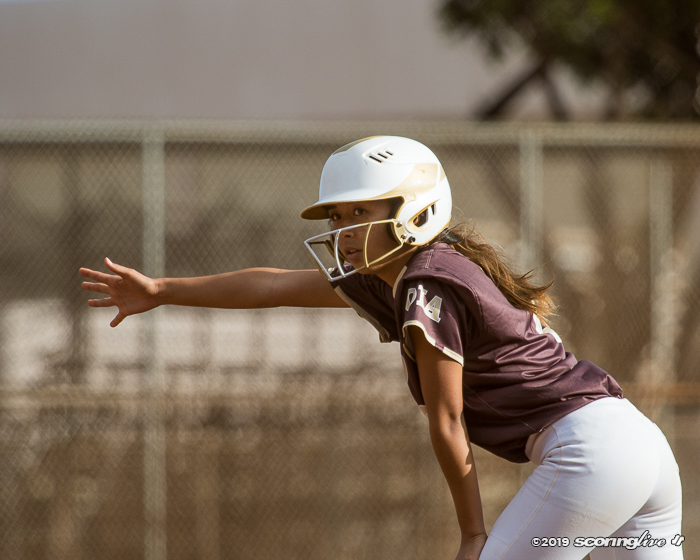 After falling behind 1-2, she fouled off two pitches to the left before working the count full. 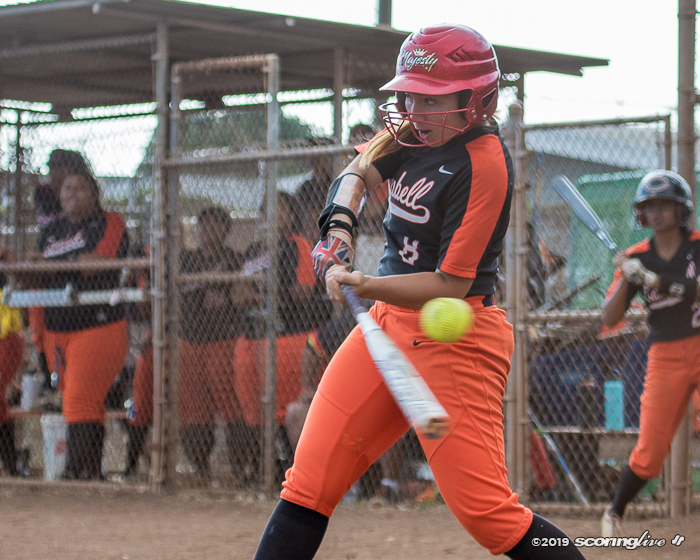 "I was trying to go to the six hole (between shortstop and third base)," Favela said of her at-bat. 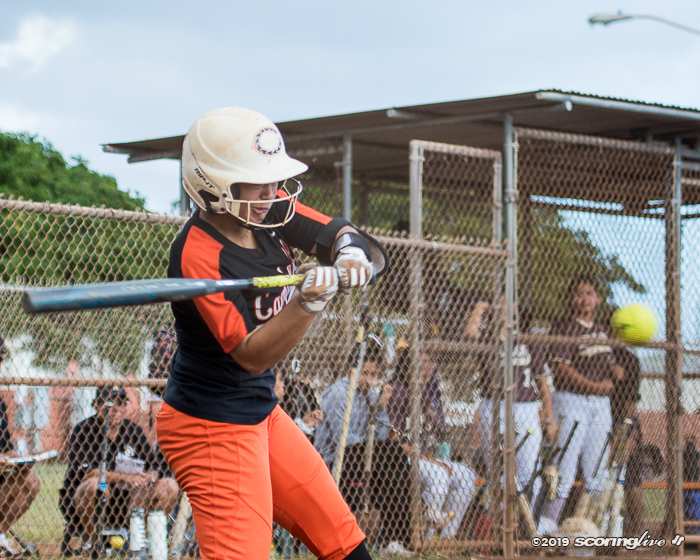 "It was kind of a solid hit." 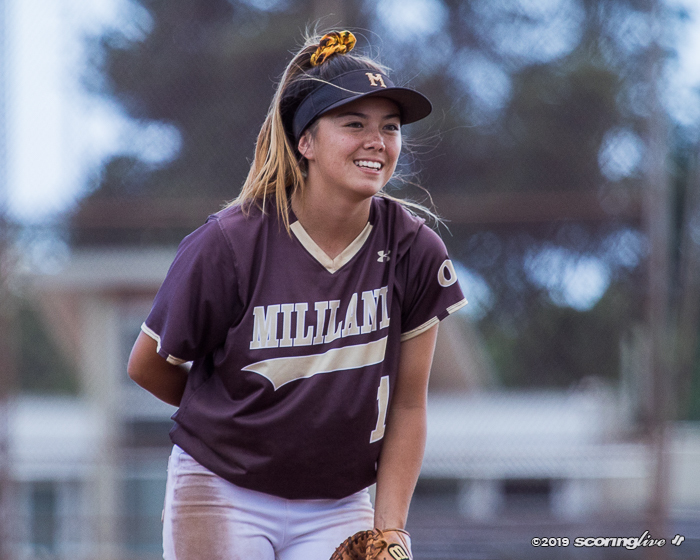 Winning pitcher Chloe Sales fired 2 1/3 innings of scoreless relief to keep the Sabers in striking range of the Trojans. 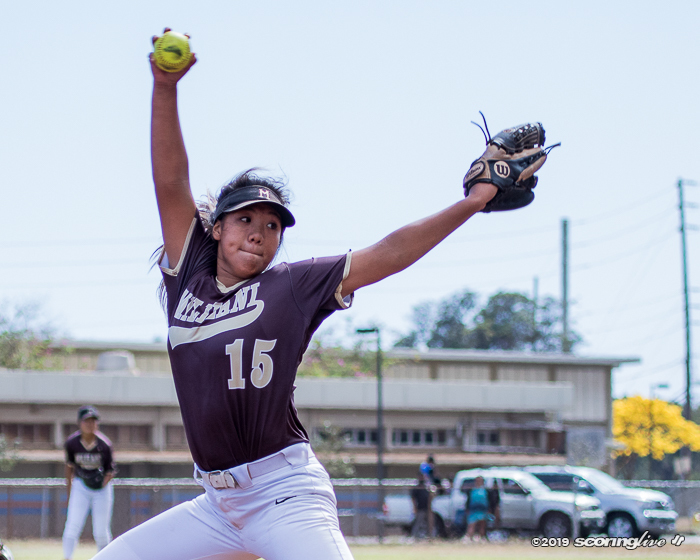 She ran into two-out trouble in the top of the sixth, but struck out Riana Abeshima to strand the potential insurance runners. 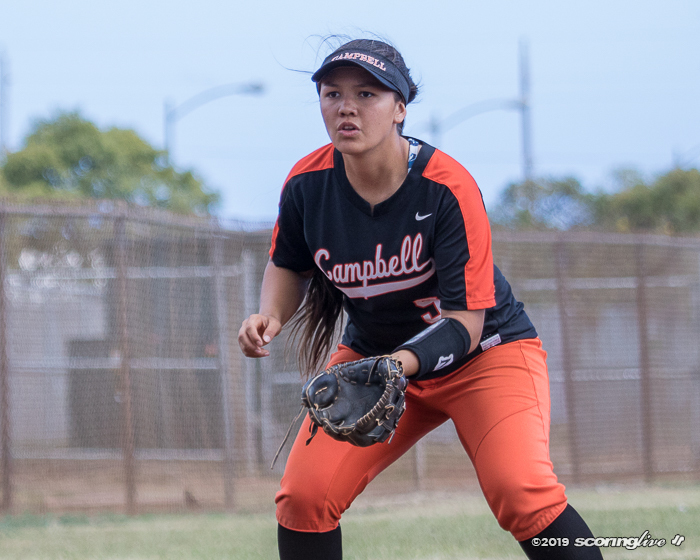 She and Nadia Delzer have been starting or relieving for each other. 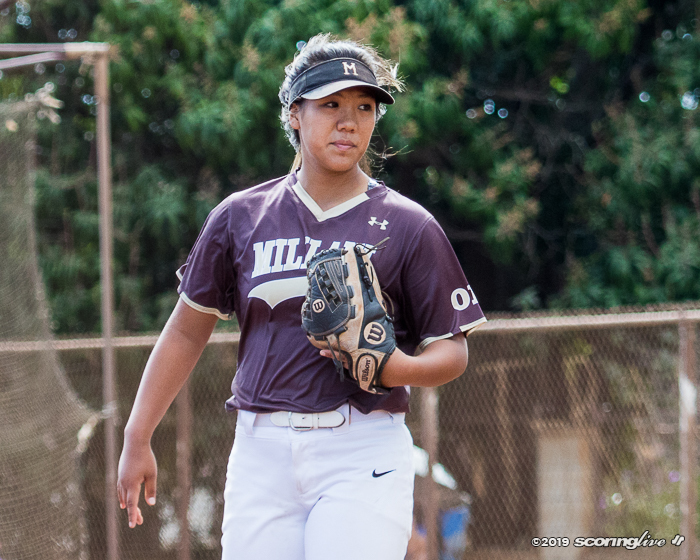 Delzer allowed five runs, five hits and four walks in 4 2/3 innings before giving way to Sales with two out in the fifth. 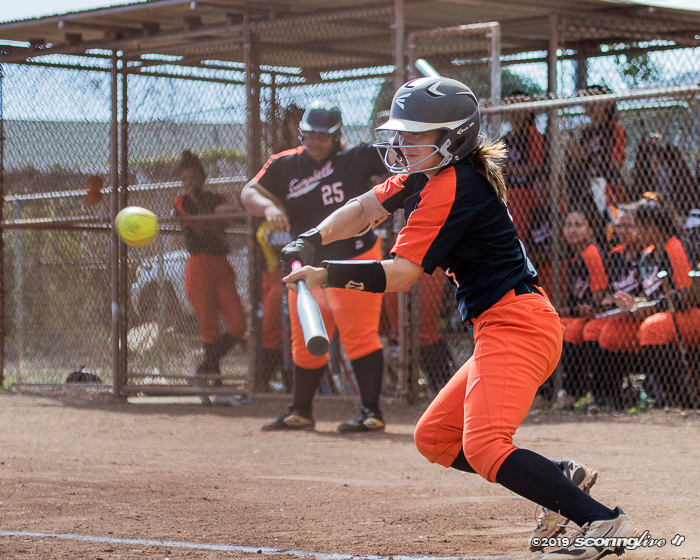 Sales struck out pinch hitter Jordyn Rosario to kill the threat. 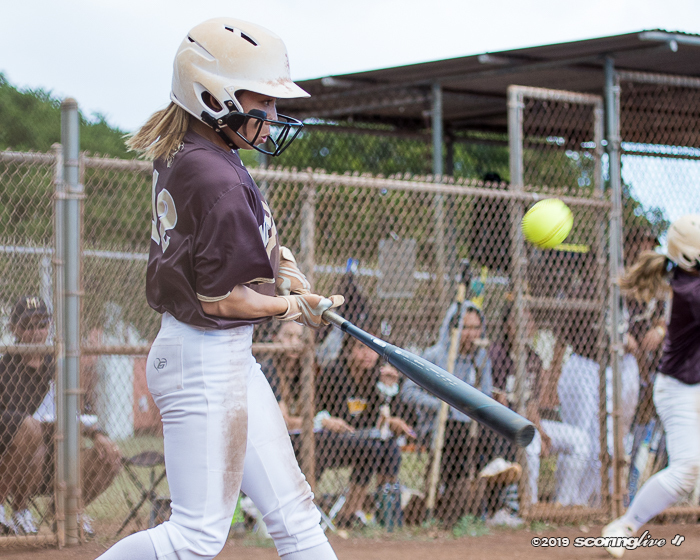 "I was just thinking about how I should get their back, especially when (Delzer) was struggling," Sales said. 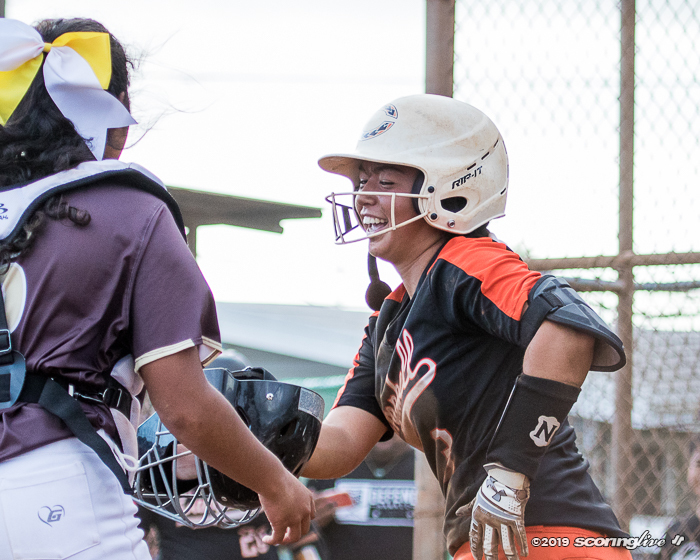 "I was telling her, ‘I'll get your back and you'll get my back when I'm struggling.' And that worked." 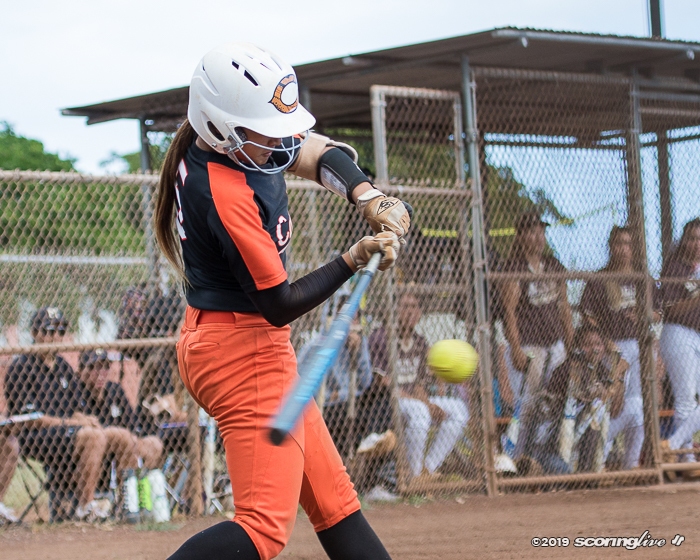 The Sabers struck first against Trojans' starting pitcher Joie Baker. 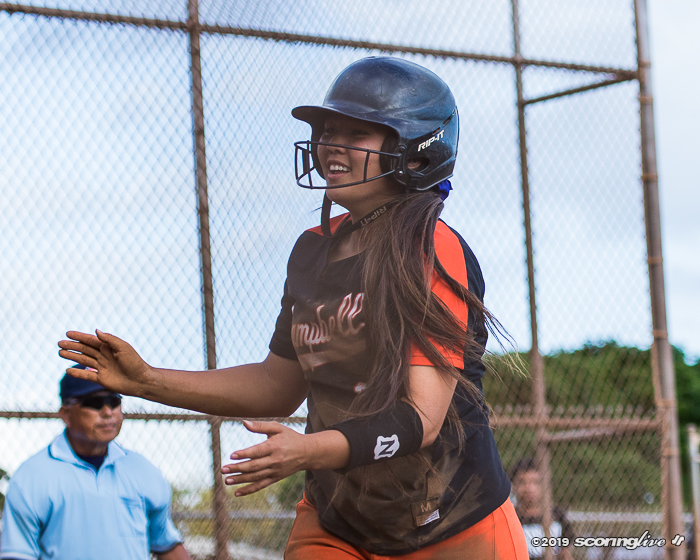 Nunes and Tatiana Liu each had two out RBI singles in the first inning. 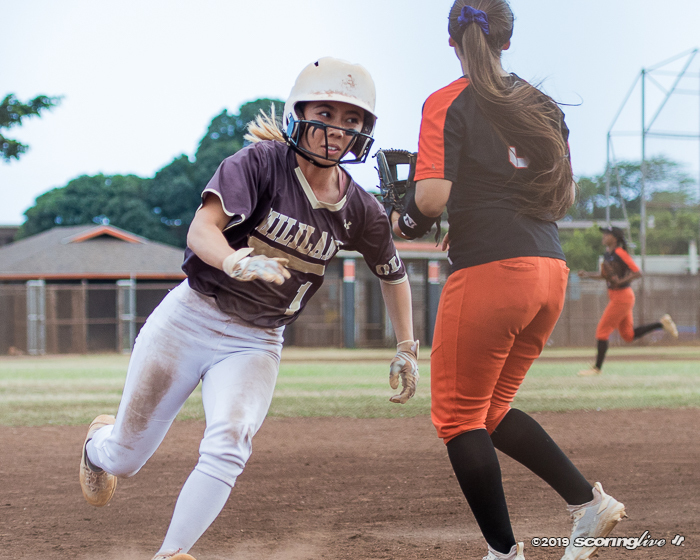 The Trojans got an unearned run in the top of the third and took the lead in the fourth on Cassidy Worzalla's two out, two-run single. 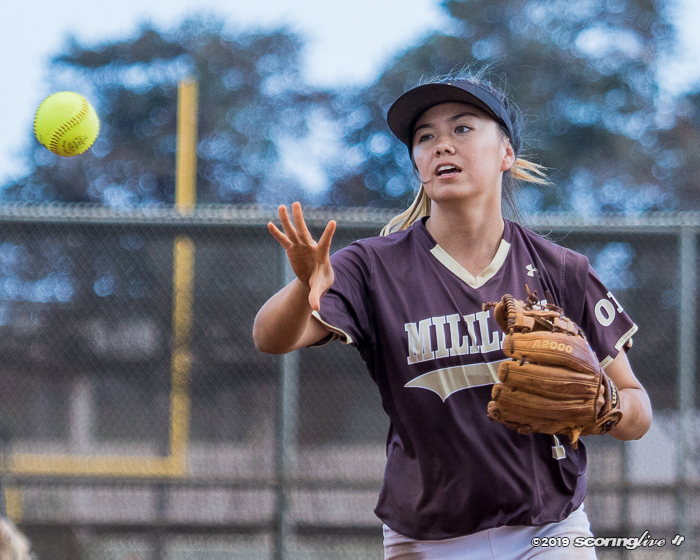 Mililani widened its lead in the fifth. 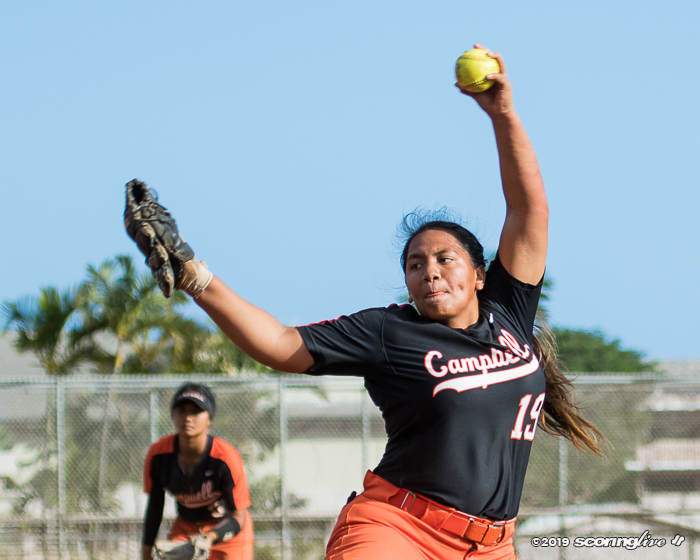 With two out, Cherise Mori doubled to left-center and Katie Carlos walked on four pitches. 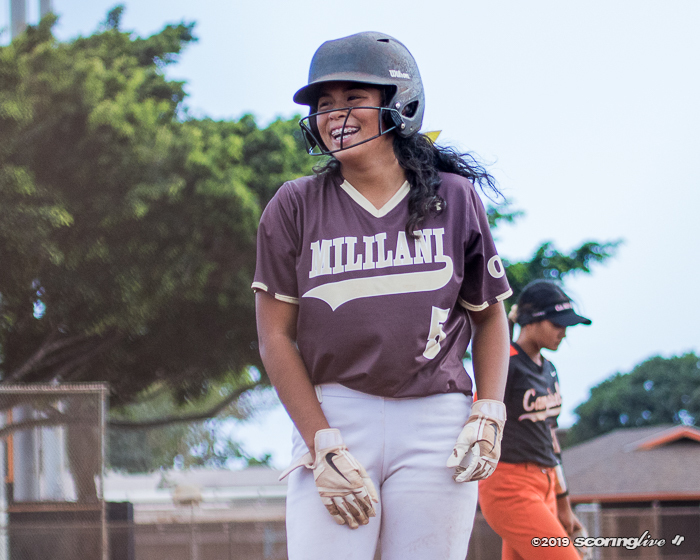 Hermosura considered pulling Delzer then, but let her face Dumlao, who drilled a two-run triple to left to widen Mililani's lead to 5-2. After Kobe Brown walked, Delzer was pulled for Sales. 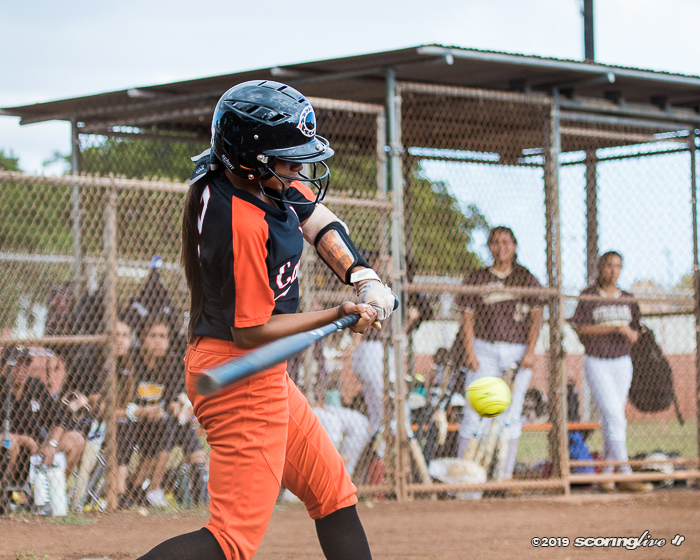 "I considered that (pulling Delzer after the walk to Carlos)," Hermosura said. 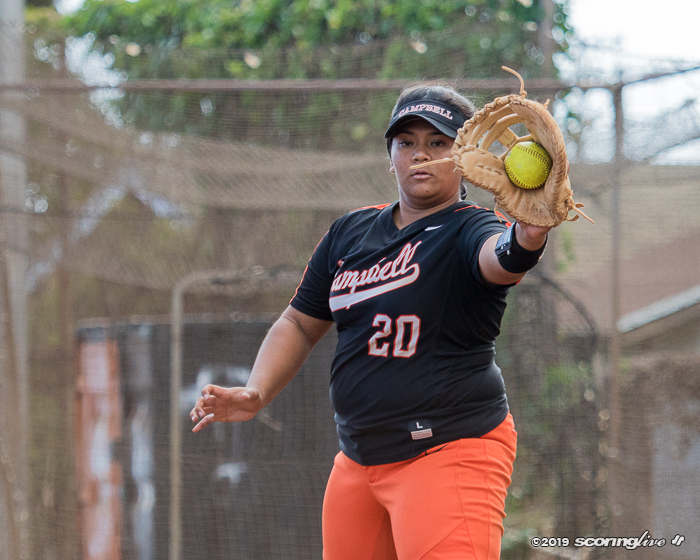 "But knowing (Delzer), I know she can fight back; I decided let's go finish up this inning. 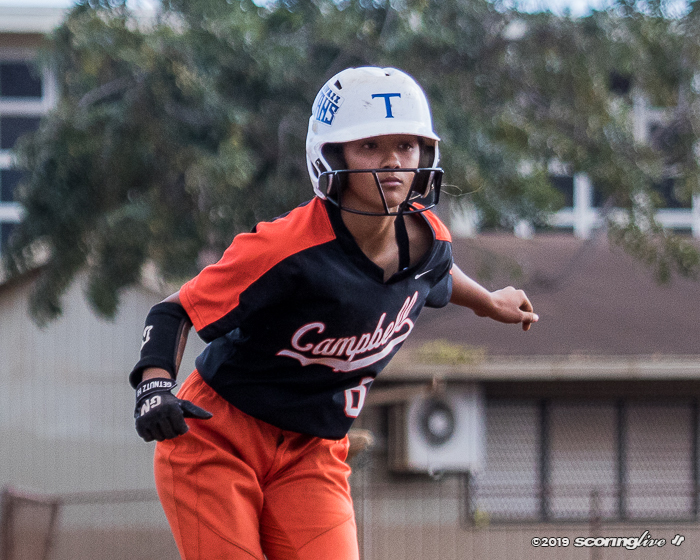 She gave us a good look into the game. Yeah, we were behind but it was a decision I had to make. 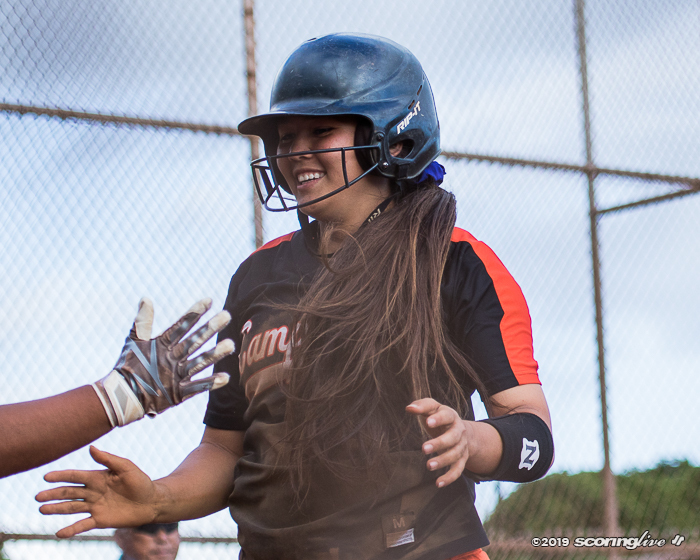 I was hoping to leave her in and hoping she could come back, but as they were getting more runs, I had to stop the game, have Chloe come in." 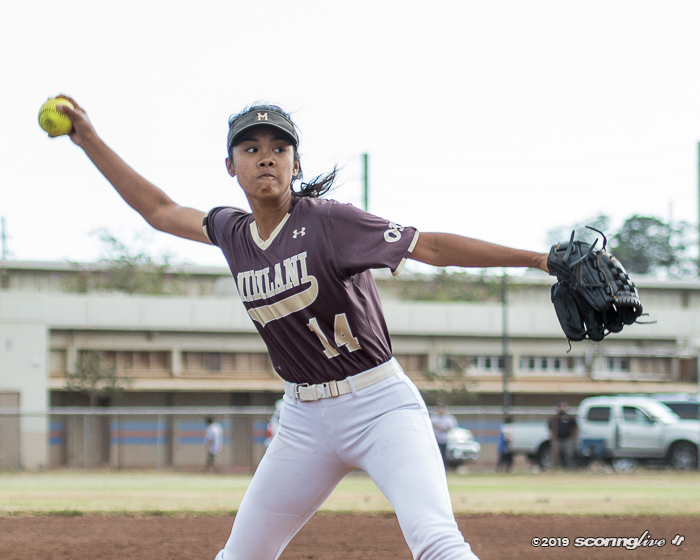 Sales stopped the bleeding and her teammates chipped away at the Trojans. 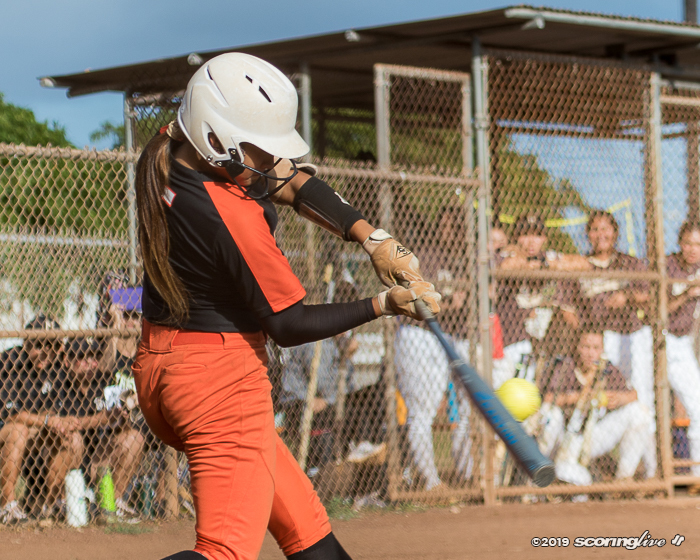 The Sabers pulled to 5-3 in the sixth. 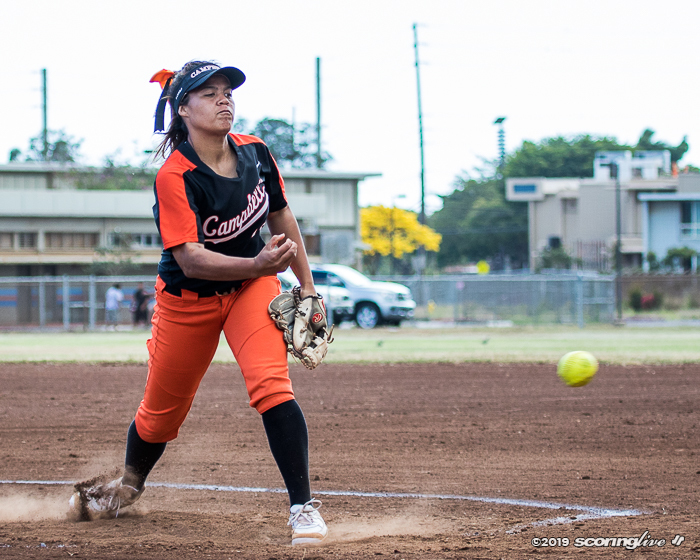 Favela beat out a single to short and took third on shortstop Nishimoto's throwing error. 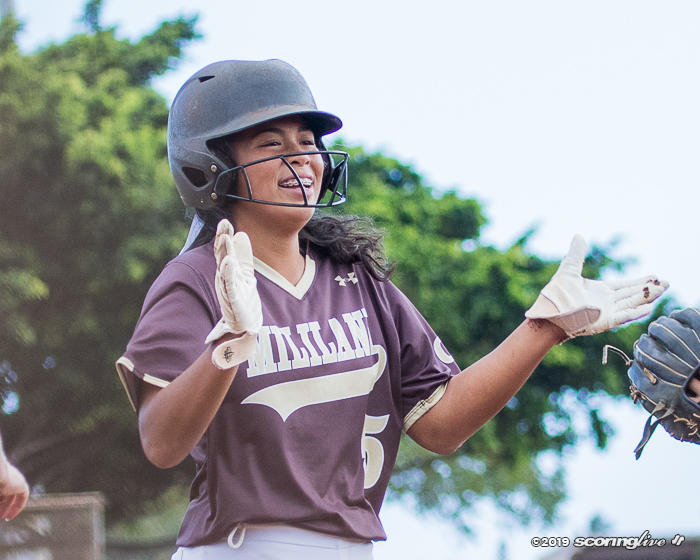 An out later, Liana Nagamine - after fouling off a squeeze - grounded a single to right. 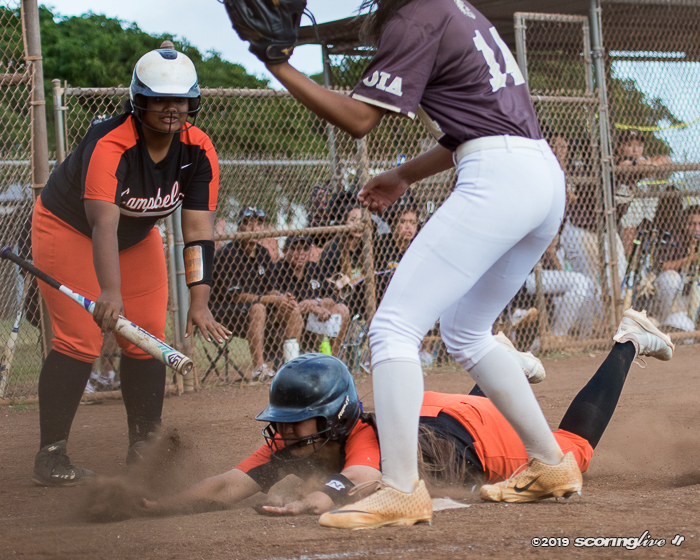 Hoku Pacheco also singled to put runners at first and second with one out to chase Baker from the game. 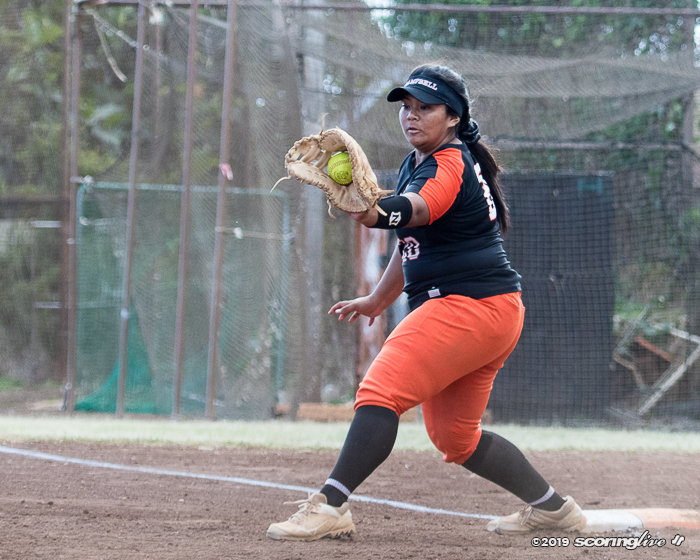 Arios came in and struck out pinch hitter Majesty Moisa and got Seaerra Fuentes-Arellano on a grounder to end the threat. 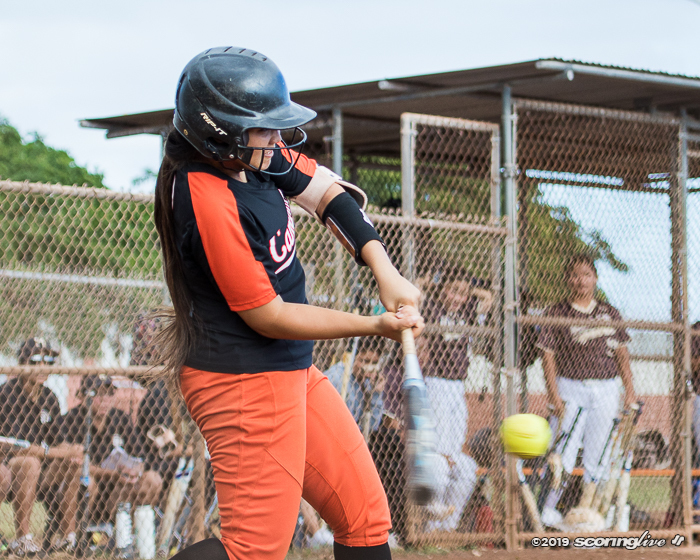 The Sabers worked their magic in the seventh for their fourth come-from-behind win. 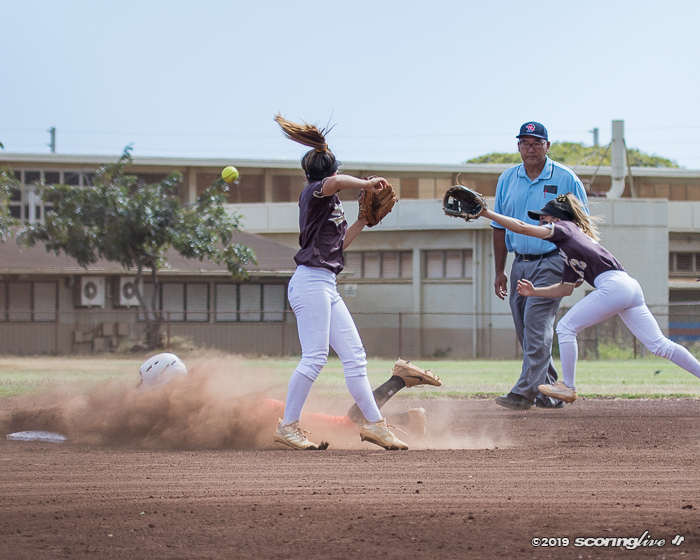 They trailed 2-1 in the fifth to Waianae (won 3-2); trailed 4-2 in the fourth to Pearl City (won 9-5); trailed 6-4 the fourth to Leilehua (won 7-6). 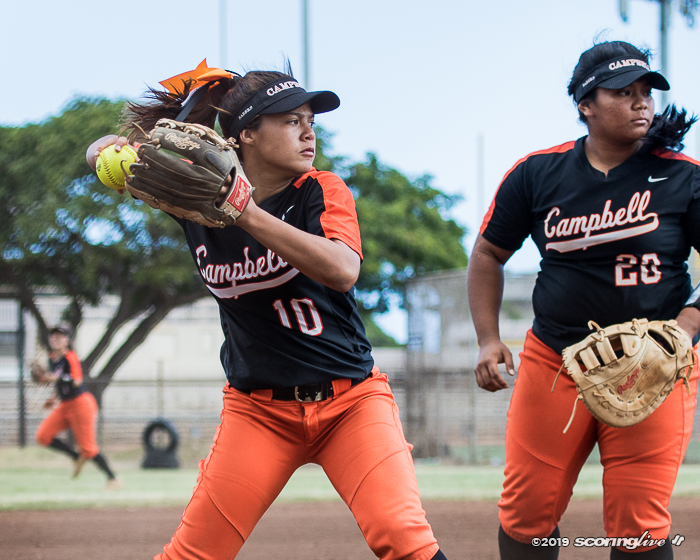 The teams resume second-round play Saturday. 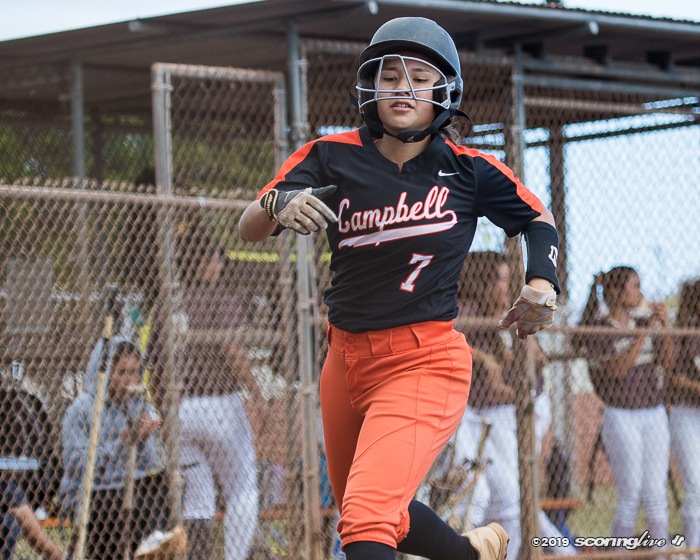 Campbell will visit Aiea and Mililani will host Pearl City. 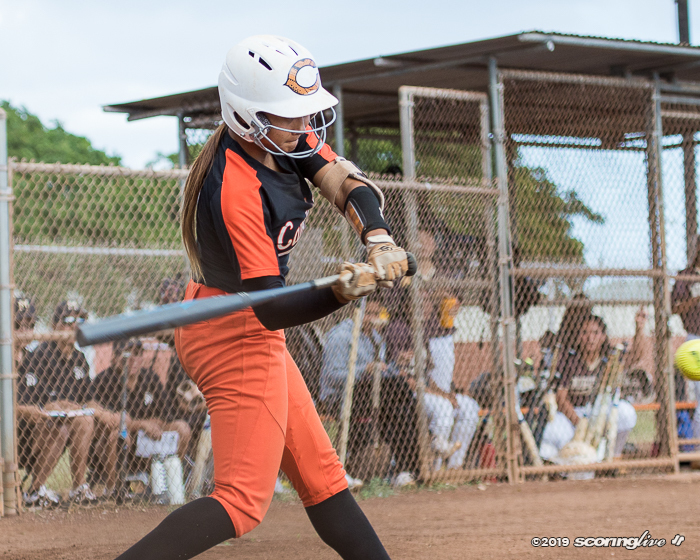 The Trojans beat the Chargers, 14-13, in a season-opening slugfest at Pearl City.